The once discontinued sneaker with a cult following is spotted in-store in Los Angeles. UPDATE: Looks like these are already sold out in the spots that had them. Early readers reported success but I've heard from a few around the country that their local stores don't have them and haven't received word of a restock. Readers are writing in with conflicting reports about what store reps and the corporate number are saying, from some back stock available to order to nothing at all. The local store I saw them in are now sold out as well. I'll keep you updated if I learn more. FYI, I called a third time, and this person (Ebony) said they do, in fact, have the shoes albeit an extremely limited supply (e.g. they don't have any size 10's). The trick is the rep has to know how to place the order. Not sure how it all works, but the rep was super nice and I have a pair of Killshots on the way… and she even waived the upcharge for 2 day delivery! UPDATE 4: 6 hours ago a Reddit user in South New Jersey was able to order 10.5's that are coming from an LA store. I've just received in-person confirmation that the Nike Killshot 2 is back at J. Crew. I was surprised to spot them on display in a store, so I called some other Southern California stores to confirm – and their answer was YES, they are back in stock. They have yet to be restocked on J. Crew's website, so currently you can only find them in-store. It's possible this may be regional, so your mileage may vary. A few readers were told a different story when they spoke to representatives at their local stores. Why is this announcement-worthy? Well, this shoe has a following so devoted that online forums like Male Fashion Advice on Reddit have created guides on how to wear it. And not surprisingly, fans were devastated when it was announced 6 months ago that the shoe was discontinued, resulting in used pairs going for hundreds of dollars on eBay. Since its initial debut almost 40 years ago as an indoor court shoe, Nike's Killshot is now revered by sneakerheads as a casual classic. 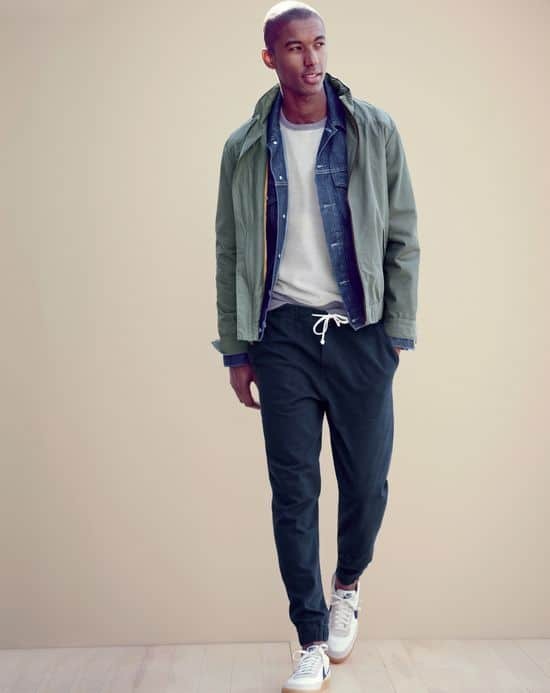 J.Crew's head menswear designer Frank Muytjens cemented its cult status with a fashionable 2009 revival, the Killshot 2: a vintage-inspired update that retains all the timeless appeal of the '70s original. It's a low-profile sneaker that has been deliberately stripped down to keep it light-weight and achieve an attractively minimalist look. Perhaps its most distinctive feature is the gum outsole, which is an especially soft rubber that provides superior traction compared to other types of soles. It's a natural gum derived from trees, thus the natural tan color – not only creating a unique contrast, but its neutral hue allows this to be one of the most versatile shoes you can own. If you like the look but want something you can order online, check out the gum sole New Balance for J.Crew 791 which replaced the Killshots when they were discontinued. If the Killshot 2 is as hot a ticket as it's been in the past, don't expect them to stay in stock for long. So for those planning on searching for them at your neighborhood J.Crew, best of luck! Was about to go on my lunch break to grab a pair at my local Jcrew, but I called ahead and it looks like only select stores are carrying them. I love that gum sole, that doesn’t get as dirty as crepe soles does it? Also, Labor Day has come and gone, can I keep wearing these? Would this show accommodate a wide foot? I can comfortably wear a 9.5 2E new balance shoe. How does sizing compare to other Nike’s? I wear an 11.5-12 in their running shoes. There is a 10.5 available at a store about 45 minutes away. I would guess that it would be too small. I tried on their other J.Crew shoe (white with blue stripe) on Sunday in my normal size and it was definitely too small. Can you tell me what specific stores had them in stock? I called every store in the Chicago area and got the same story: they are a discontinued item. I then called J. Crew corporate HQ (1-800-562-0258). The first person I got said they are not in any stores anywhere, but the main warehouse had a *very* limited supply and offered to place a phone order for me. I didn’t pull the trigger, and later when I decided to order, the next person at the corporate number said the first person was mistaken – that there are none in any stores nor any warehouse anywhere. Looks like there’s a lot of confusion going on, as evidenced by the different stories readers are getting. The store that had multiple sizes in LA is now sold out, I’ve updated the post and will continue to update if I can get more intel. FYI, I called a third time, and this person (Ebony) said they do, in fact, have the shoes albeit an extremely limited supply (e.g. they don’t have any size 10’s). The trick is the rep has to know how to place the order. Not sure how it all works, but the rep was super nice and I have a pair of Killshots on the way… and she even waived the upcharge for 2 day delivery! Damn, nice!! Thanks for the update! Awesome! Just did the same thing and have a pair being shipped as well. Thanks for the info! how much are they going for anyway? !!!!! I checked my local store here in San Antonio. They said they don’t have them in YET. She couldn’t say whether or not they would but there’s a slim ray of hope. Called j crew. They are aware of this post and referenced Primer Mag specifically. She said the article is incorrect and they do not have any available and would not allow me to backorder these :/ anyone else have some luck? People are getting conflicting options when they call. Some are able to order and others aren’t. Thanks Andrew! I’ll keep trying. I just called J. Crew’s 800 number and was able to order a pair in size 12. The sales rep said that that was the only of the “larger” sizes left (not exactly sure what he considers large) but I’d try giving them a call. Andrew, an idea for your next post… “What to wear after you realize you’ll never own a pair of Killshot 2s”. I’d love to know what alternatives you’d reco in this same style. Thanks!